For the second year the Museum is bringing back the tradition of pageants to the site of the Hendon Aerodrome. Along with a vintage fairground, vehicles and engine displays and live re-enactors the event will host a community hub. At the hub visitors can find out more about our community partners and the local projects the Museum supports and is involved with. Barnet Libraries' Year of Learning is an exciting programme of events and learning opportunities for everyone in the borough. There is a whole year of activities for children, teenagers and adults with a different theme each month! As part of July's 'Explore the World' month the outreach team will be at Burnt Oak library on 6 July from 2pm-4pm running a drop in session for families focused on the RAF's role across the globe. We'll be offering a craft activity inspired by our new Hat Wall in Hangar 1 and a selection of RAF uniforms to explore and try on. A team from our London headed to Brooklands Museum for their exciting Concorde Day. This event was filled of Concorde-themed activities to celebrate the 50th anniversary of her maiden flight. The RAF Museum had uniforms from the period of Concorde's first flight for visitors to try on as well as a badgemaking craft activity. Local entrepreneurs from Barnet brought the festive spirit to Grahame Park selling handmade goods ready for Christmas. The Museum outreach team trialled a new badge making activity allowing local people to create their own badges to celebrate the special people in their lives. Barnet Libraries presented an evening with Dr Ronnie Fraser in association with the RAF Museum London. They story of the established British Jewry's involvement with the Royal Flying Corp in the First World War is both glorious and inglorious, full of bravery and the mundane. Whilst the story of the immigrants is more complicated, all sectors of Jewish society were involved ranging from the rich and famous to the middle and working classes. The Jewish experience of the war was no different to that of other sections of British society as all sections of Anglo-Jewry lost many of their young men. Dr Ronnie Fraser was awarded a Doctorate in Jewish history by Royal Holloway College in 2014 where he studied under the late Professor David Cesarani. He is currently volunteering as a researcher for the RAF Museum looking at Jewish involvement in the RFC as well as the project 'Jews in The First World War - We Were There Too'. In October half-term, SoundSkool and the RAF Museum ran a free music and performance course for young people in Colindale and Barnet. Participants took part in writing and recording music that told stories of local history, and performed a showcase as the RAF Museum for visitors. The Museum took part in the Grange Big Local Fun Palace at East Finchley Library. As well as having fun trying on RAF uniforms local families and residents took part in a paper aeroplane challenge; folding paper into different planes to see which flew the furthest, a Vulcan, Typhoon or Tornado F3. A community festival for Grahame Park Estate residents. Taking part in the Fun Day helps give us a bigger presence in Colindale, and gives us a great opportunity to show off our collection and history to residents of the area as well as the variety of opportunities we can offer local people. The museum team showcased objects from our handling collection, uniforms for attendees to try on and the Historic Vehicles Team took vehicles from the collection. Two groups of 15-17 year olds from NCS The Challenge taking part in photography projects over 3 sessions. Second group involved participants speaking to and photographing volunteers to better understand their roles and their importance within the Museum. Members of local community groups and Colindale Consortium members were invited to attend the Museum's Community & Press Day where they enjoyed previews of our new London site prior to its Royal Opening on 29 June when members of the community who assisted the Museum with the Historic Hendon Project met HRH the Earl of Wessex. Ten students from the Middlesex University BA (Hons) Illustration course have created a collection of short stories which explore events on and around the Museum’s site from 1910 to the present day. The stories take us from the grassed airfield of the London Aerodrome, through the years of RAF Hendon, to the current day Grahame Park housing estate and the RAF Museum. These were published on 31 May, with a Reception held at the Museum later that evening to thank the students and their Tutors for all their hard work. The Rithmik Course ran during May Half Term giving local young people skills in radio production, research and presenting. The output included interviews with staff, visitors and archival research. The RAF Museum London is a community hub and we invite English for Speakers of Other Languages (ESOL) learners to our Conversational Café. The main purpose of our Café is to give them a chance to practise their English while discussing and sharing their stories, thoughts and memories together. ESOL learners can came together in a relaxed, informal environment in the RAF Museum’s café, to practise their spoken English skills. The sessions used themes and resources developed by Barnet and Southgate College, and RAFM volunteers worked with participants to support their learning, encouraging discussions in small groups. The Conversation Café is run in conjunction with partners at Barnet and Southgate College, Timebank Barnet and Barnet Homes. In the first week of the Easter holidays, SoundSkool and the RAF Museum will be running a free music and performance course for young people in Colindale and Barnet. Participants will take part in writing and recording music that tells stories of local history, and will perform a showcase at the RAF Museum for visitors. Sign up is essential, only ten places left. Email info@soundskool.co.uk for signup and info. The RAF Museum, Groundworks and the Loop present a one-day upcyling workshop at the RAF Museum, aimed at encouraging new residents in Colindale explore the local area and the museum, and meet their neighbours. In the the February half-term holidays, Head Held High and Rainbow Head are partnering with the RAF Museum to run a free music and performance course for young people in Colindale and Barnet. Participants will take part in making stop-motion animation or stand up comedy pieces that tell stories about themselves and role models from history. At the end of the week participants will perform a showcase at the RAF Museum. Sign up is essential, only ten places left. Email stopandlaugh@rainbowheadyouth.co.uk for signup and info. In the first week of October, Barnet Council runs a Silver Sunday week as part of the National Silver Sunday celebration, with organisations all across Barnet joining in. The RAF Museum put on a special talk at the RAF Museum on Thursday 5 October, held underneath our magnificent Lancaster Bomber. The free talk was one of our community talks from the 'Discover to Share' project, on the subject of Historic Hendon. It was written and delivered by RAF Museum volunteer Tim Bracey, looking at local history related to aviation. Like many museums, young people make up disproportionately small part of the RAF Museums’s visitors, currently only around 5%, so working with partners such as ARTiculate and seeing young local people connecting with the Museum’s collections and stories has been really rewarding. The RAF Museum is in the middle of a large redevelopment project to mark 100 years of the Royal Air Force and we will see 3 new exhibitions open in 2018. The exhibitions will focus on ‘people’ and their experiences, and aims to prompt debate around difficult subjects. This year’s ARTiculate project ‘Hidden Voices’ did just that. It was focused on, as the name suggests, two of the RAFs more hidden or difficult stories -, women and mental health. Over the week of the project the young people researched areas that interested them and created some beautiful and thought provoking artwork. Hopefully some of the ideas they explored will make into the new exhibitions. A real highlight of the project was seeing the young people working together, regardless of their background, considering hard-hitting issues and dilemmas that affected people at Hendon before them. Poignantly, one project involved designing parachutes for the Flying Nightgales. A group of women who flew from RAF Hendon during World War II as nurses tending to wounded airmen, . they were not allowed to fly with parachutes. The young people thought about words that summed these women up – brave, supportive, proud, excited – and used these words to create a parachute collage to help the women. Projects such as ARTiculate are vital so that young people have access to high quality creative activities, and it is a fantastic opportunity for the RAF Museum to be able to work with and support the young people on the programme, and explore local history with them. In the first week of October, Barnet Council ran a Silver Sunday week as part of the National Silver Sunday celebration, with organisations all across Barnet joining in. 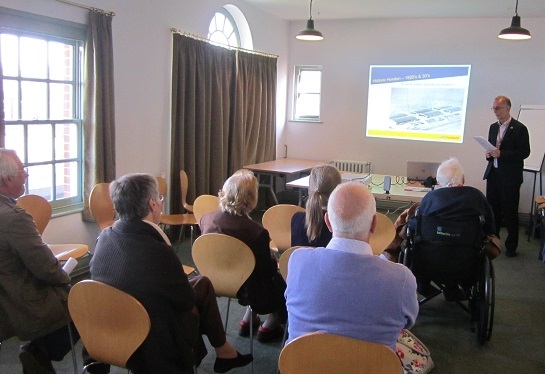 The RAF Museum put on a special series of talks on Monday 3rd October aimed at older groups, with one on Asian RAF Pilots, and one on Historic Hendon. The event was great fun and enabled older Barnet residents to share their memories of RAF Hendon. Altogether Better Burnt Oak held their annual parade and festival at Silkstream Park on Saturday 17 September. The RAF Museum attended to support the event with a craft table making foam planes, and handling collection items, giving residents and members of the public the opportunity to try on uniforms and hold historic objects. We co-organised a new event on the Grahame Park Estate on the evening of the 8 September, an open air screening of The Goonies for local residents. The RAF Museum will be supported the event with our community volunteers, and showed original films from the 1920's of the London-Manchester Air Race and the 1929 RAF Hendon Pageant. Barratts London, in conjunction with Metropolitan Homes, held their annual Fun Day for residents of the West Hendon and Stonegrove estates on the 3rd September from 12noon to 3pm. The Museum attended with a craft table and handling collection, giving residents and members of the public the opportunity to try on uniforms as worn by Second World War RAF Pilots. We attended the Grahame Park estate's for the annual Urban Gamez. On the day there was a 60m race track, football, climbing wall, face painting, arts and crafts, music and refreshments and a great atmosphere! We brought photos from the museum collection showing RAF crew playing sport during WWI, showing what RAF staff did on their downtime. On Friday 22nd July we attended at the Pulse Community Fun Day at the Pulse Flats by Colindale station. We had good regular footfall to the RAFM marquee through the afternoon, talking to local residents about the museum collection, volunteering and Names on a Plane. We attended the Grahame Park Fun Day on Saturday 9th July, with six stands including object handling, volunteering, crafts, vehicles, prize giving and Names on a Plane. We had the support of a great team of volunteers, including cadets from 120 ATC, who also brought a table to talk about the opportunities for joining the ATC. A thank you to everyone who helped out with organisation of the event. Taking part in the Fun Day helps give us a bigger presence in Colindale, and gives us a great opportunity to show off our collection and history to residents of the area as well as the variety of opportunities we can offer local people – the day went really well and we had good footfall at all of the stands.